Take a look at BLR’s latest Recruiting Survey. How does your company measure up against the competition? 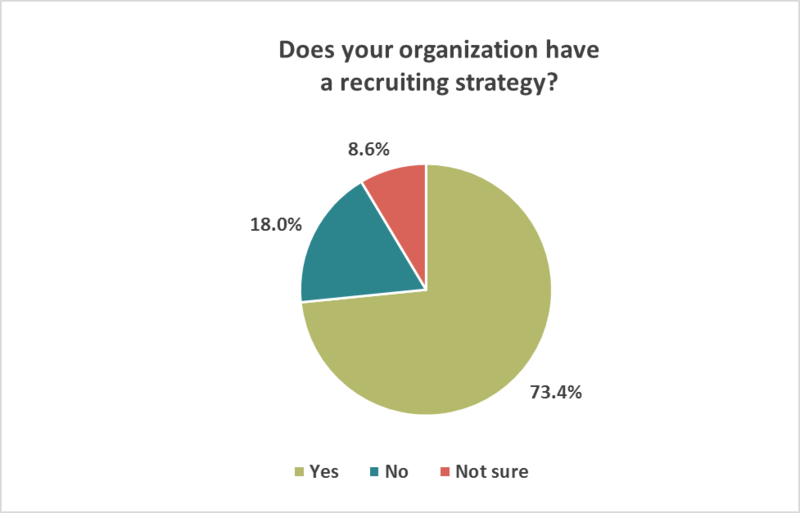 The HR Daily Advisor Research Team conducted the Recruiting Survey in November, 2015. Online recruiting has become a quintessential aspect of recruiting overall. This raises a few important questions. To what extent is online recruiting being used? How exactly is it being used—and what about online recruiting works and what doesn’t? Additionally, have traditional methods of recruiting disappeared in the wake of online recruiting, or are they still being used in tandem? The purpose of this survey was to answer these and other related questions. Nearly as many participants say they have replaced traditional recruiting methods with online recruiting (29.5%) as say that online recruiting is just another tool in the recruiter’s belt (31.6%). Most survey takers (62.2%) say they do not use software to track or measure their online recruiting despite the fact that 73.3% say they use online recruiting as part of their recruiting strategy. Most respondents (39.5%) say that social media is not important to attracting good candidates. In fact, the majority of participants (58.7%) have very little interaction with their candidates over social media. 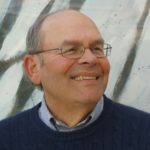 Participants scored “Retention” as the single most important method for measuring quality of hire at 55.0%—at least 35 points above any other method. Only 23.7% of survey takers track cost per hire. 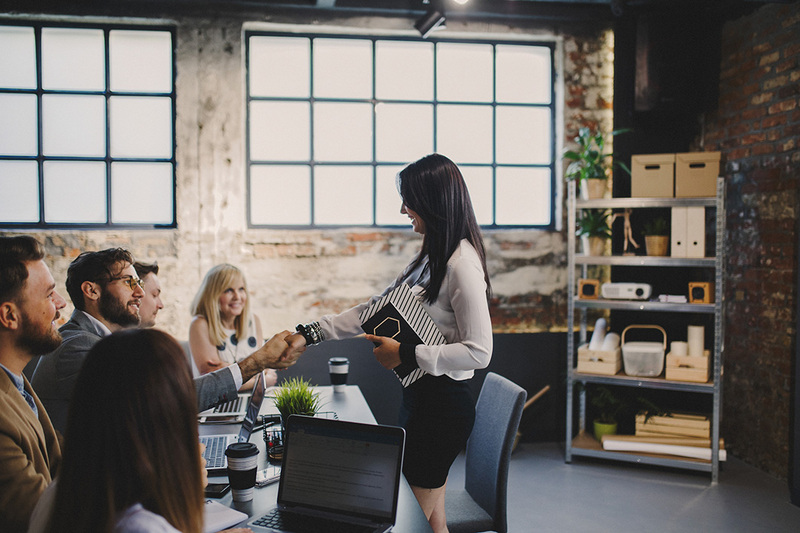 Even though 73.4% of participants said that management had a role to play in onboarding employees, more than half (51.3%) of participants said that their management teams receive no training on how to successfully onboard new employees. The majority (73.4%) of those polled said that yes, they do have a recruiting strategy. Only 18.0% said they did not. 8.6% said they did not know if their organization had one. When asked what they used to find recruits, 75.1% of respondents said they use their company’s website, and 74.8% said they use referrals. The next highest response (69.8%) was “Online recruiting resources” such as Monster® and Glassdoor. The least used resources for finding recruits were “State or federal employment services” at 31.8%, and “Staffing firms/Temp agencies” at 35.5%. When asked if they would be willing to negotiate benefits, 52.9% of respondents answered “No” while 38.6% answered “Yes.” 8.5% were not sure. The benefits most likely to be negotiable include “Paid time off, amount of vacation, sick days, and / or PTO” with a response of 57.5%. The next highest responses were “Hours of work” at 43.6% and “Cell phone or other mobile device” at 41.7%. The least negotiable benefits were dental and vision plans, both around 11%. Do You Use Online Recruiting? Not surprisingly, the overwhelming majority of respondents (80.9%) said that yes, they do use online recruiting. However, there are still 10.6% of respondents that said they do not use online recruiting. The highest responses in the various categories for the question “What percentage of open positions do you post online for the following job types” can be split into two categories. Temporary positions like students, interns, freelancers, consultants, and temps were the most likely not to be posted online. Meanwhile, the majority of entry level, midlevel, professional, management and executive jobs were posted online. The largest disparity was for professionals, with 76 to 100% of those jobs being posted online by 62.7% of respondents and 0% of professional jobs were posted by 7.3% of respondents. According to the respondents, the majority (33.4%) said that 76–100% of their advertised jobs are filled from online applications. More respondents answered “Unknown” (8.5%) or “Don’t know” (9.7%) than said that 1–10% or 11–25% of their jobs were filled from online job applications. In other words, those who said very few jobs were filled from online applications represented a smaller portion than those who either didn’t know or had no way of knowing. 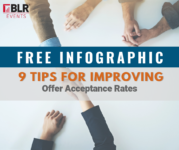 Respondents said that “Online recruiting resources” (39.9%) and “Your company’s website” (32.9%) were the most successful means of online recruiting. Interestingly, “Online communities” were said to be the most successful by only 11.1% of respondents. Similarly, “Social media outlets” scored very low at 4.0%—the same as university job boards and was outperformed by “Trade association websites or job boards” (8.2%). The majority of survey takers (38.1%) felt that they have had some success using job boards and 22.1% of survey takers admit that they have gotten quite a few good applicants from them. That means 60.2% of all survey takers have a generally positive view of them. Conversely, only 4.8% say they get their best candidates from job boards. 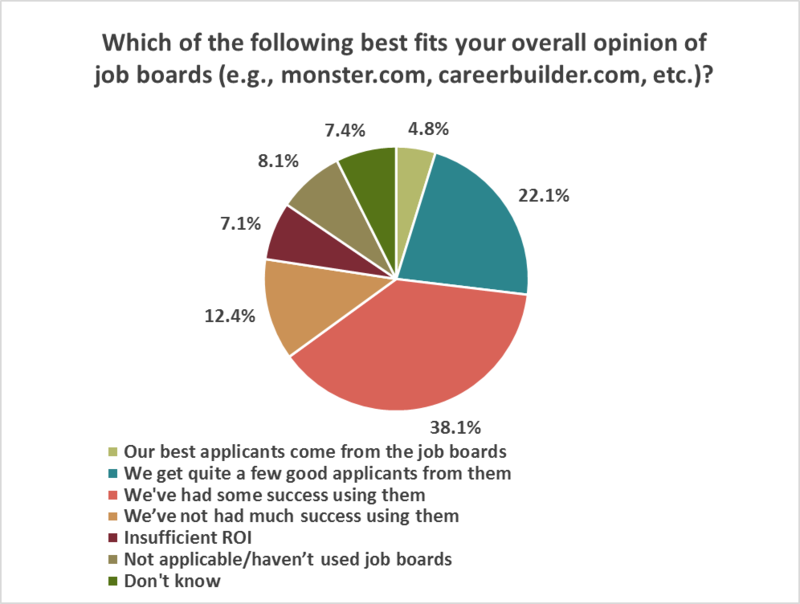 Only 12.4% say they have not had much success using job boards, and 7.1% say it’s not worth the effort (insufficient ROI). Do You Search Online Résumés? 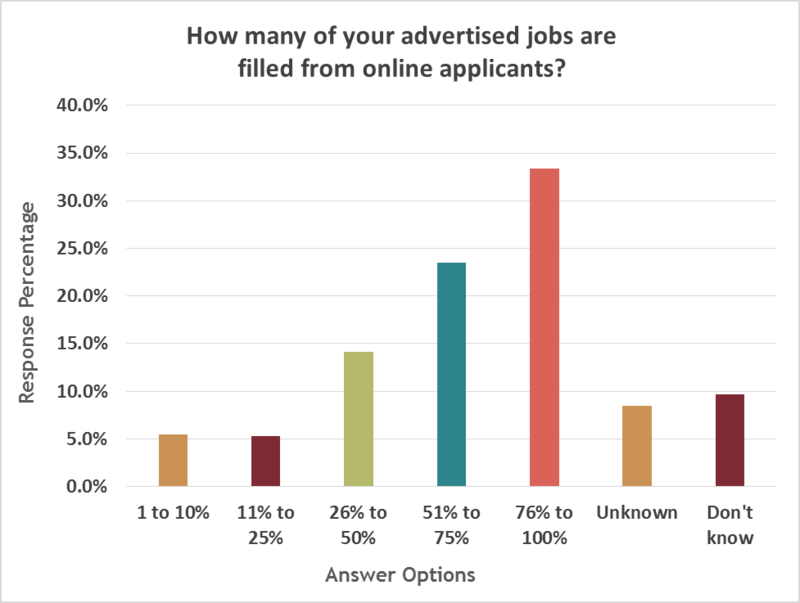 The audience was fairly evenly divided when asked if they actively search for and review potential applicants who have posted their résumés online. 47.1% said they did, and the majority (52.9%) said they don’t. 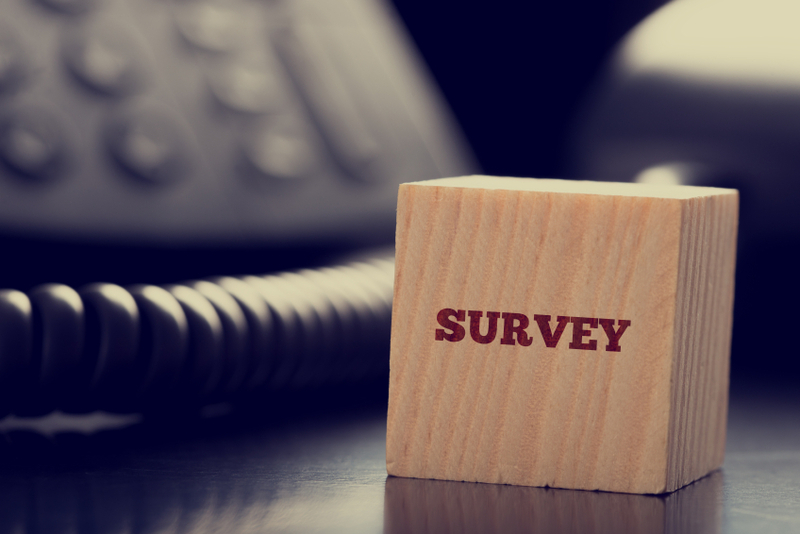 When asked if they had eased off other methods of recruiting in favor of online recruiting, a significant amount of survey takers (31.6%) said that it’s just another tool and hasn’t replaced any traditional methods. 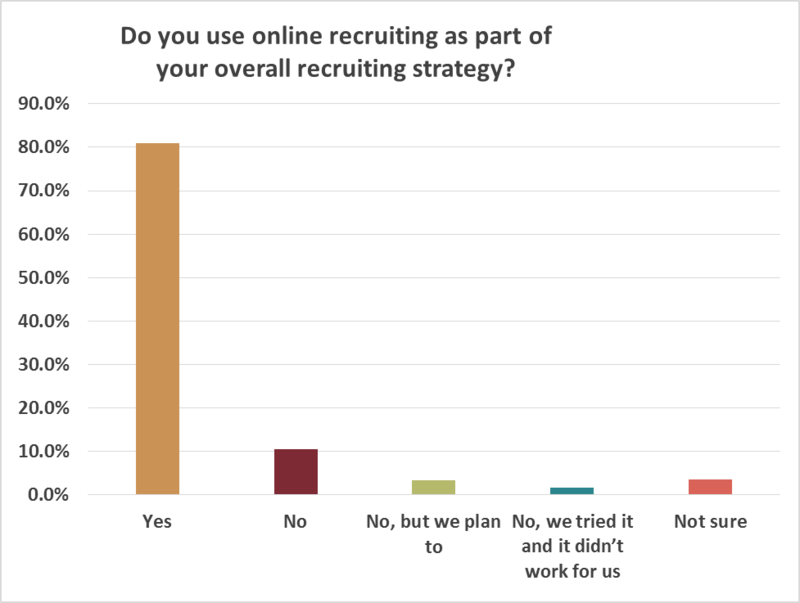 The next highest response (29.5%) simply said “Yes” while the third group (25.4%) said “No.” There is a clear and roughly equal divide then between using online recruiting in favor of other methods, concurrently with other methods, or not using it in favor of other methods. When asked which was more expensive, cost per hire online or other methods offline? 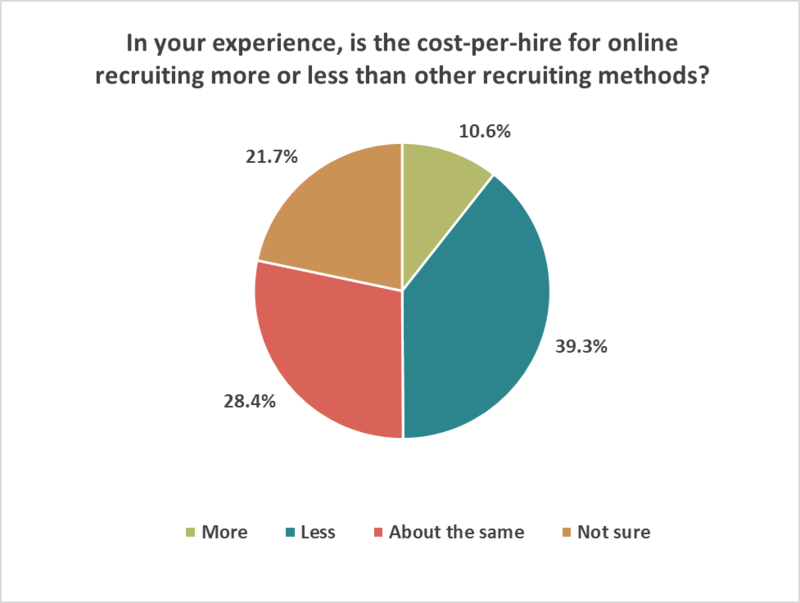 The majority (39.3%) said that online recruiting was less expensive than other methods when it comes to cost per hire. 28.4% said it was about the same, and 21.7% felt that they were sure that it was. Only 10.6% felt that online recruiting was more expensive per hire. When asked if online recruiting resulted in bringing candidates faster, 46.6% said that “Yes,” it did. Only 6.5% said “No.” Furthermore, 21.9% said it depends, and 17.0% said it was the same as regular recruiting methods. The largest response to the question “what are the biggest pros of online recruiting?” were split between “Ease of use” (57.7%) and “Reaches outside of a small population pool” (58.7%). Other popular answers were “Ability to reach passive job seekers” (45.6%), “Faster time to hire” (41.8%), and “Cost” (37.2%). The largest con of online recruiting, according to survey takers was by far “Too many unqualified applicants” at 68.3%. That’s almost double the second most common answer, “Too many applicants,” which was marked by 30.4% of respondents. Of least concern was “Too few applicants” (8.5%) and “Doesn’t reach a broad audience” (6.5%). 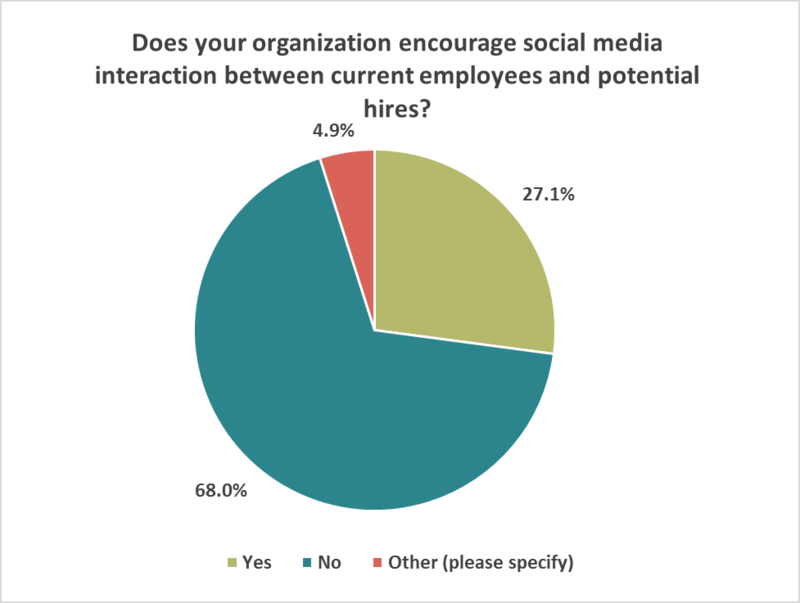 Over two-thirds (68.0%) of respondents say that “No” they do not encourage social media interactions between employees and potential hires.” 27.1% said that they do. Very few respondents suggest that any significant portion of their candidates have interacted with them over social media. 58.7% of respondents suggest that between 0% and 20% of their candidates have done so. The results of this question mirror the previous question closely. 64.0% of respondents said that between 0% and 20% of candidates interacted with managers over social media. 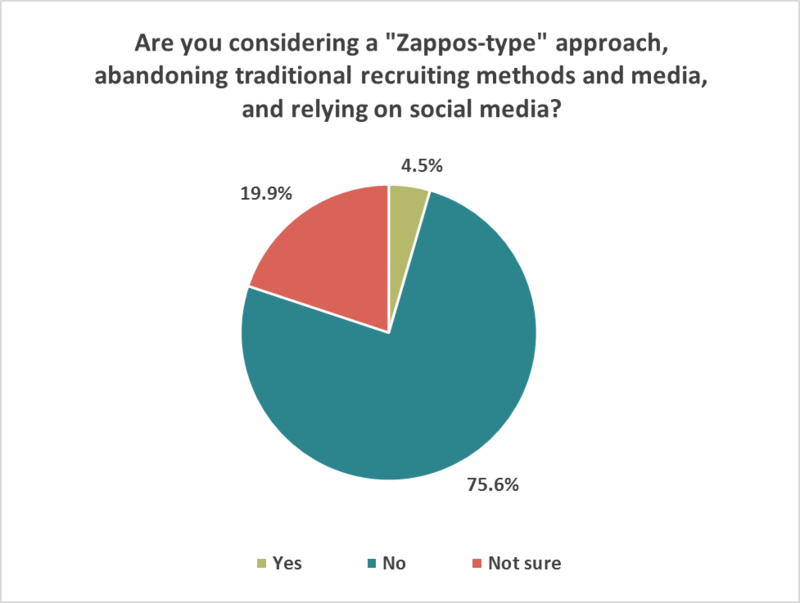 Three-quarters of respondents said that they are not considering a “Zappos-type” approach to recruiting—abandoning traditional methods and media in favor of social media. More people were unsure (19.9%) than those who said they were going to try that approach (4.6%). Tomorrow, more results from the Recruiting Survey, plus an introduction to BLR’s premier recruiting event, RecruitCon 2016.